Did you know you could save up to $9,600 per eligible new hire? With an integrated, intuitive product like Payentry’s Hire & Onboarding getting this money is even easier. First things first, where’s the money coming from? The Work Opportunity Tax Credit program was designed to help targeted workers move from economic dependency into self-sufficient tax payers, all while rewarding the employers who hire those individuals. In simple terms: hire a member of one of the target groups and receive a tax credit. Even those businesses who may be exempt from paying taxes, like nonprofits, can still participate in the program and apply the credit to their payroll taxes. Great! So which individuals qualify? Note: There are very specific requirements an individual must meet tot qualify as a member of any of these groups. For more detailed information on those requirements visit the IRS website. This all sounds cool, but how do you get the credit? Basically, there is a certain set of questions you need to ask a new hire in order to determine if they qualify as a member of any of those target groups. Once you determine that the individual qualifies as a member, you submit an application and a few forms. If you’re thinking this sounds easy enough already without an automated system here’s the bad news: you only have 28 days from the date of hire to get that application submitted and accuracy matters. Simply submitting the application within the short window doesn’t mean it will be accepted. If the Workforce Agency finds mission information or a mistake, you still only have the initial 28 days to get it corrected and resubmitted, there are no extensions. 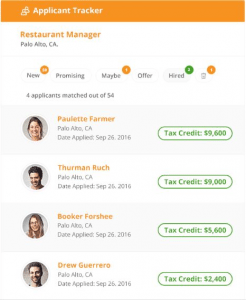 The potential hire’s eligibility status even appears in the applicant tracker so you know ahead of time if they qualify for a credit and, if so, the amount of the credit. After you hire an individual you can submit the application with just a few clicks. This allows for faster submission to the appropriate agencies and a quicker turnaround for the tax credits. At the end of the year, Payentry generates everything your corporate tax preparer needs to claim your tax credits. If this sounds interesting to you, please contact our sales team to demonstrate how easy it is to take advantage of the WOTC opportunities as you hire new employees. Our product is so easy to use, it typically takes less than 15 minutes to show you what we’re all about!